Today is Thanksgiving Day in America. 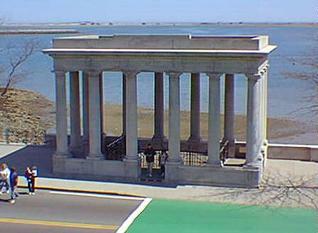 'Thanksgiving' is a custom that dates back to 1620, when 53 survivors of the ship, Mayflower, came together with the Wampanoag Indians at Plymouth Rock (modern-day Massachusetts, U.S.A.) to offer thanks and gratitude for a bountiful harvest, made possible by mutual cooperation and collaboration - suspicion and hostility notwithstanding. Over the years, Thanksgiving has endured - and evolved - to become America’s most cherished and celebrated tradition. Millions of Americans travel to be with their families, making it the busiest travel day of the year. Families will gather around dinner tables adorned with turkey and other traditional Thanksgiving fare. Friday' when they hope to hear their cash registers jingle. The hoopla is not complete without the annual Macy's parade, a fixture in New York since 1920. My first Thanksgiving was in 1976. I had arrived in this country only a few weeks earlier, in September, as a student and barely knew my way around the university campus (in upstate New York). As Thanksgiving approached, there was a flurry of travel plans being made, with students rushing off to be with their families. Going home was the operative word. The day before Thanksgiving, the campus wore a deserted look. No one was in sight, except for newly arrived students like me, who had nowhere to go. Going home did not apply. And I did not think of America as home - yet! Enter Professor Christopher Lasch, the noted social historian, author of The Culture of Narcissism and my academic advisor. Perhaps he knew of my predicament. He invited me to share Thanksgiving dinner with his family, at his home, which was out in the country, next to a farmer's barn. Being in a historian’s house for Thanksgiving dinner meant that I got a history lesson followed by traditional Thanksgiving fare: Turkey, cranberry sauce, mashed potatoes, green beans, yam, and corn bread, followed by pumpkin pie. Thirty-five years later, I will be celebrating Thanksgiving again, like I have every year. The tradition continues, but much has changed. In 1976, there were only a handful of South Asians on the campus. 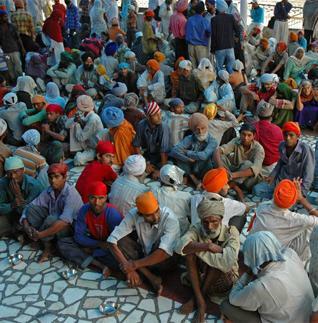 I was the only Sikh. There was no home to go to. This year, my wife and I have waited in anticipation for our daughter (a college sophomore) to come home for Thanksgiving. Tonight, we will gather with friends and their children for dinner. A student with no “home” to go to will accompany us. The large influx of immigrants (including Sikhs and others from the subcontinent) has given Thanksgiving a new look and a new flavor. The dinner fare looks decidedly different. Take the turkey, for instance. I, for one, never really cared for its dry and grainy taste, made palatable only with lots of stuffing and oodles of gravy. For years, my wife tried to moisten up the bird with extra basting (which merely meant more butter or ghee). She would also spice up the stuffing (Punjabi style) so that it would taste better - and familiar. A few years ago, we discovered the deep-fried turkey. Tastes great but demands a large tub of oil. Over the years, we have drifted away from cooking turkey and have settled for tofu instead. Lately, I find that there is growing interest in vegetarianism and turkeys have been given some respite through the intervention of many support groups, who have cried foul over the cruelty to the bird. 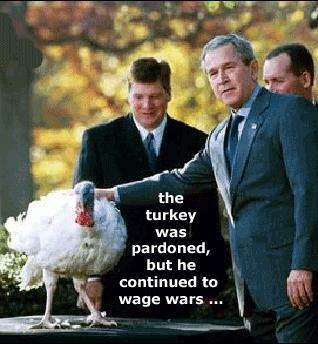 The mockery of the annual Presidential pardon is quite obvious. Incidentally, I read today that one of the Minnesota turkeys bound for Washington (to be potentially pardoned) decided to try and break away - unsuccessfully, I might add! For immigrants, Thanksgiving has a special significance. 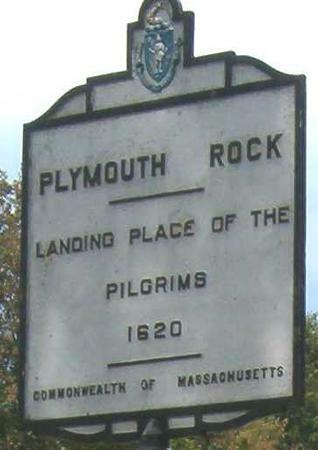 It is our connection to the original Pilgrims who landed at Plymouth (I heard on the radio today that they were heading for Virginia but had to stop in New England because they ran out of beer). We share with the pilgrims a sense of hope for better things. Fittingly, the Thanksgiving issue of the New Yorker magazine this week carries an illustration depicting the pilgrims - but with a twist. A group of pilgrims is shown, not getting off a ship, as you would expect, but crawling through a hole in a barbed wire fence, and scampering under cover of night into a desert. The title of the illustration: Promised Land! The comparison with undocumented immigrants, especially Mexicans, is unmistakable. It is a thought-provoking and powerful statement that needs reflection. We Sikhs-Americans, like many 'new' Americans, find the notion of setting aside a special day for Thanksgiving – like Mother's Day, for instance - a bit odd. Shouldn’t we be offering thanks every day, if not with every breath? Yes, we should, but there is something to be said for mixing thanks and gratitude with a communal meal. Thanksgiving is in the best of Sikh tradition - combining pangat and sangaṯ. 1: Baldev Singh (Bradford, United Kingdom), November 24, 2011, 7:12 AM. 1620 was a bad year for our beautiful earth and that beautiful continent with it's humans living in harmony with 'Mother Earth' and now 'gone' - it's greed, racism, narcotics, foreign 'oil wars' and violence of every description. 2: Ajit Singh Batra (Pennsville, New Jersey, U.S.A..), November 24, 2011, 8:54 AM. Your comment, Baldev Singh ji, is a historical reflection based on present day needs. But whatever comes from Him, we should surrender with cheerful acceptance. This is devotion of the highest order. It strengthens the will to serve. 3: Gurdev Singh Bir (Columbus, Ohio, U.S.A.), November 27, 2011, 10:49 PM. The Meaning of Thanksgiving Day"